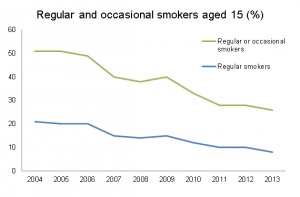 For nearly 20 years England has been doing great work to tackle the harms caused by smoking. Cigarette advertising is banned, the age of sale for tobacco has been increased to 18 and enclosed public places have been smokefree since 2007. In the pipeline we see the display ban due to be rolled out across all shops in England in 2015 and, with consultations now complete, there is legislation in place for a ban on smoking in cars with children and the potential introduction of standardised tobacco packaging. 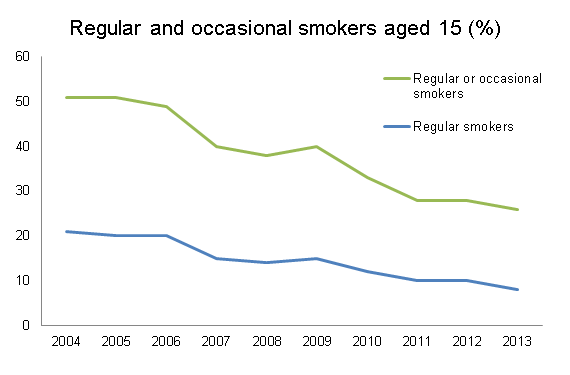 All this has led to a continued significant decline in smoking prevalence and the numbers of young people smoking is at an all-time low – with just 8 per cent of 15 year olds smoking. A smoking in cars ban will go some way to help reduce the harm cigarette smoke causes to vulnerable children, as well as further helping to denormalise smoking. And the introduction of standardised packaging would be a powerful boost in our efforts to achieve a tobacco free generation. It is an important step in reinforcing to young people that smoking is not cool and help deter people from taking up smoking. Smoking causes nearly 80,000 deaths in England every year, remaining the number one cause of preventable death in the country. To put that into context: smoking causes more deaths than the next six causes combined. Not to mention the huge burden of smoking-related illness. So while there is continued focus at a national level to drive down smoking prevalence, there is also much work that can be done locally. With their public health responsibilities and in-depth knowledge of their areas, local authorities stand to make real gains in tobacco control. But where to start? I’m pleased to report that there are a range of tools available to support local authorities in their efforts. This week we have published a Joint Strategic Needs Assessment (JSNA) Support Pack to help local partners inform the JSNA process and to commission comprehensive tobacco control interventions. PHE has published this as part of a suite of documents, also covering drug and alcohol service commissioning. The Local Tobacco Control Profiles for England provide a snapshot of tobacco use, tobacco related harm, and measures being taken to reduce this harm at a local level. These profiles have been designed by PHE to help assess the impact of tobacco use within local populations. They are designed to inform commissioning and planning decisions to tackle tobacco use. PHE’s CLeaR self-assessment tool is an evidence based improvement model which helps local authorities to review their current efforts and develop further action to reduce smoking prevalence. Training is available from PHE for partners to understand and make the best use of this tool. The NICE tobacco return on investment tool evaluates a variety of tobacco control interventions and models the economic returns that can be expected from each. Different interventions can be mixed and matched to see which package provides the best value for money and return from investing in tobacco control. A number of organisations have come together to create the ASH Local Toolkit for tobacco control. This provides local public health professionals with a set of materials to use with Councillors and other stakeholders to help ensure that tackling tobacco use is high on the local public health agenda. Comprehensive local tobacco control: why invest? Protecting children from harm: Children exposed to tobacco smoke are at much greater risk of cot death, meningitis, lung infections and ear disease. Tackling health inequalities and boosting the disposable income of the poorest people: It is a stark fact that the smoking rate in Kingston upon Hull is double that of Kingston upon Thames. Driving improvement across key measures of population health: Reducing smoking rates will impact on core indicators included in 3 out of the 4 public health domains. We are now in striking distance of achieving a tobacco free generation. It will remain one of our key priorities. But we cannot do it alone and it will require concerted effort in local areas. This is vital and what will ultimately make the difference in getting us to our goal. Great blog on local tobacco control. The tools within, and external, of PHE are helpful aid to support the action needed to achieve a tobacco free generation. It was good to identity with the inequalities and may be specific bespoke tools and aids are needed for this too. A great blog, as always Kevin. I do not support smoking!